What will historic preservation look like in 50 years? Some of the presenters at the 7th National Forum on Historic Preservation Practice. From left to right: Stephanie Toothman (National Park Service), Compton J. Tucker (NASA), Brenda Barret (Living Landscape Observer), and Ann Horowitz (City of Alexandria, VA). 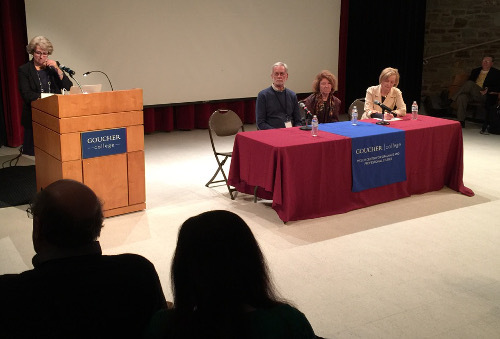 A few weeks ago, I attended the 7th National Forum on Preservation Practice hosted by Goucher College, which focused on the next 50 years of practice. One thing I’ve always liked about the National Forum is that it has a mix of both practitioners and academics, which helps to facilitate productive exchanges that otherwise would not occur. The conference is similar to the yearly preservation conference hosted by the National Trust for Historic Preservation, but it’s much smaller and far more intimate. All presentations take place in the same room throughout the day, in serial, rather than concurrent fashion. There are also plenty of opportunities to get into in-depth conversations with the people doing on-the-ground work in the regulatory/planning, design/conservation, interpretation, and advocacy work of the field. Perhaps not surprisingly, a major topic of the presentations and discussion was the effect of climate change on historic resources. (It was nice to see some of the conference presenters give a plug to the upcoming Keeping History Above Water Conference.) While not much was particularly revelatory for those who have been following this area, having Compton Tucker from NASA summarizing the current state of climate change was a nice, and somewhat unexpected treat. Constance Ramirez, who has held numerous positions in the field, including Director of the Federal Preservation Institute (NPS), made a compelling argument for the need to include adjuncts in the governance of academic programs and for institutions of higher education to develop Ph.D. programs in historic preservation. (Currently, the master’s degree in historic preservation is considered to be the “terminal” degree, a characterization that Ramirez turned into a witty pun for her presentation.) I wholeheartedly agree with the need to give adjuncts a greater say into aspects of a program, such as curricular design, especially because so many historic preservation programs at the post-secondary level are either adjunct heavy or entirely reliant on adjuncts (including program directors). Currently, there are a handful of doctoral programs in historic preservation, such as the Ph.D. in Heritage Studies at Arkansas State University, a Ph.D. in Historic Preservation at the University of Texas, Austin, and a Ph.D. in Preservation Studies at the University of Delaware. The first two are quite similar to public history doctoral programs while the latter lets a student choose from a number of areas, including preservation planning and preservation/conservation technology. In a US context, I question whether the field, currently, is large enough to be able to place graduates of these kinds of doctoral programs into historic preservation programs as teachers, which was Ramirez’ central argument. Unfortunately, there just aren’t that many historic preservation programs at institutions of higher education. Currently, around 1-2 tenure-track positions may become available in any given year in the field. One of the most thought-provoking presentations was by Bryan Orthel and Barbara Anderson (Kansas State University) on the possibility that, in the future, heritage will be mostly virtual and largely divorced from tangible fabric as meanings and discourse move increasingly online. While perhaps a slightly dystopian future, seeing how younger generations increasingly experience a reality mediated through technology (e.g., smartphones, computers) lends credence to this vision. The implication, however, that I see in the present is that heritage conservation educators need to be more aware of how people use social media technology in expressing meanings and values associated with tangible heritage and learn to embrace this change rather than fear or reject it. Lastly, I was particularly heartened by a continual theme of the social sciences throughout many of the presentations, including the need to educate historic preservation students in social science theories, applied research methodologies, and conflict resolution skills. I’ve heard this for a long time from academics, but this was the first time I heard a strong and consistent call from practitioners—both on the panels and in the audience—that we need to be producing students that have an understanding of the social sciences (e.g., anthropology, sociology, environmental psychology, humanistic geography). The larger question, however, is if and how this can happen in today’s educational climate. There are many barriers, including a lack of available expertise, how to introduce a new curricular component into an existing program without increasing credit hour requirements, and what learning outcomes students should be held accountable. Other programs—especially in Europe and Australia—do incorporate some or all elements of this social science component in their curricula, so there are templates (as I have discussed elsewhere on this site). Perhaps the field is at a turning point in recognizing that students of historic preservation/built heritage conservation programs need to be exposed to components of critical heritage studies theory and applied social science research methods in addition to the long established, conventional emphasis on architectural history, documentation, and rationalistic preservation theory. What I think will drive this transition more than any other factor is that students will increasingly demand this perspective in their education. I think many millennials intuitively understand the need and benefits of a practice that focuses on people as much as fabric. I don’t think we need to convince our students to move in this direction, rather they will eventually convince the educators. Bookmark this article What will historic preservation look like in 50 years? One of the reasons I don’t go to conferences like the one at Gaucher — aside from not being invited and the fact that self-congratulation turns my stomach — is that I think that historic preservationists need to get their eyeballs out of their navels and quit BEING historic preservationists. In fifty years there ought to be no self-defined interest group going under that title. Those interested in keeping old buildings and sites should recognize themselves as part of a larger interest group that wants to hold on to, celebrate, document, and make reasonable ongoing use of cultural heritage writ large — language, lifeways, relations to the environment, societal values — and work with others design new systems in support of those interests. Many existing historic preservation systems — notably those circulating around lists, schedules, and registers of places — separate us from natural allies and blind us to new possibilities; they need to be re-thought with reference to the broad goals of heritage management. Yes, historic preservation needs to shake itself loose from its art/historical/architecture roots, but I see the regulatory environment as an almost impenetrable barrier to making this transition without some radical breakthroughs. Too few people question the genesis of the field’s doctrine or even know its history of development sufficiently to step back and realize that not much has changed in 50 years. (John Sprinkle’s book on the genesis of the NR criteria ought to be standard reading in any preservation theory class, for instance.) And if it doesn’t change in the next 50 years, work on recognizing and conserving buildings, places, and landscapes will become further marginalized. Preservation educators really need to wake up to this change because we’re all suffering (to some extent) with decreased enrollment of students in our degree programs. Making “historic preservation” (or whatever we want to call it) more culturally relevant and sensitive to stakeholder’s meanings is not an option, it needs to be a requirement. You and I may see the rationale in moving historic buildings in the face of rising sea level, but if they’re on the National Register, they would no longer “officially” be historic and technically (if someone were to bother to do so) could be delisted. According to the NR criteria, “[S]tructures that have been moved from their original locations … shall not be considered eligible for the National Register.” Lots of local registers work in the same way because their criteria are also based on the NR in some fashion. Should we amend the NR so that buildings moved in the face of rising water should be a “criteria consideration”?